UKOLN has announced a Request for Proposals (RfP) For HTML5 Case Studies. The proposals for HTML5 case studies and demonstrators should describe best practices and scenarios for making use of HTML5 and related Open Web Platform standards in areas of relevance to those working in the higher and further education sectors. The proposals should address new features of the emerging HTML5 standard (e.g. canvas; geo-location; local storage; video; form fill; etc.) or related standards which form part of the W3C’s Open Web Platform such as the CSS, DOM, MathML, etc. Application areas might include, but are not restricted to, benefits to institutional Web site (e.g. SEO benefits or enriched functionality); teaching and learning applications (course lectures delivered via video, audio, etc. ; lab notebooks); research applications (e.g. articles, series, journals; books; table of contents; bibliography; citation); multi-channel access; etc. The proposals should describe how the work was implemented and the ways in which the new functionality was (or could be) implemented in a real-world context of legacy browsers; possible lack of development tools; etc. Case studies must be made available under a Creative Commons licence and if accompanying code is provided this should be made available under an appropriate Open Source licence. A sum of £5,000 is available for each accepted submission. The deadline for submissions is Monday 18 July 2011. Accepted proposals must agree to provide final case studies by 16 September 2011. Further information is available on the UKOLN Web site. Yesterday I came across a stream of tweets about schema.org. A post on the official Google blog was the initial post I saw: Introducing schema.org: Search engines come together for a richer web. This was followed by Yahoo’s post “Introducing schema.org: A Collaboration on Structured Data“. Not to be left out on the Bing blog Microsoft provided a similar post “Introducing Schema.org: Bing, Google and Yahoo Unite to Build the Web of Objects“. The endorsement for deployment of structured semantic HTML markup from the main search engine vendors would appear to suggest that this approach will succeed whereas initial approaches, such as microformats, did not live up to their promise. The question will be how quickly CMS vendors respond or whether in-house development will provide an opportunity for rapid deployment of the schema.org vocabularies. Of course there will also be a need for organisations to monitor the benefits in order to ensure that this provides additional benefits over other SEO techniques. publicly show what you like, agree with, or recommend on the web. The +1 button can appear in a variety of places, both on Google and on sites across the web. For example, you might see a +1 button for a Google search result, Google ad, or next to an article you’re reading on your favorite news site. Your +1’s and your social connections also help improve the content you see in Google Search. We’re working on a +1 button that you can put on your pages too, making it easy for people to recommend your content on Google search without leaving your site. Hmm, so as well as providing semantic markup from schema.org it should also be possible to use Google’s social networks to provide recommendations. As described on the Read Write Blog just over a month ago Facebook announced that in addition to the ‘Like’ button which enables recommendations to be made available within the Facebook environment a Send button can be used so that “Facebook users will be able to share content with specific groups of friends, rather than everyone on their friends list, giving them the precision sharing tool they’ve needed all along“. Discussions on Twitter on the implications of the schema.org announcements have already started with @hvdsompel suggesting that “schema.org is yet another illustration that google is the most powerful standardization organization. A dictatorial one for that matter“. The following year IWMW 2006 featured a workshop session on “Exposing yourself on the Web with Microformats!” which explored ways in which richer semantics for content held on institutional Web sites could be exposed. 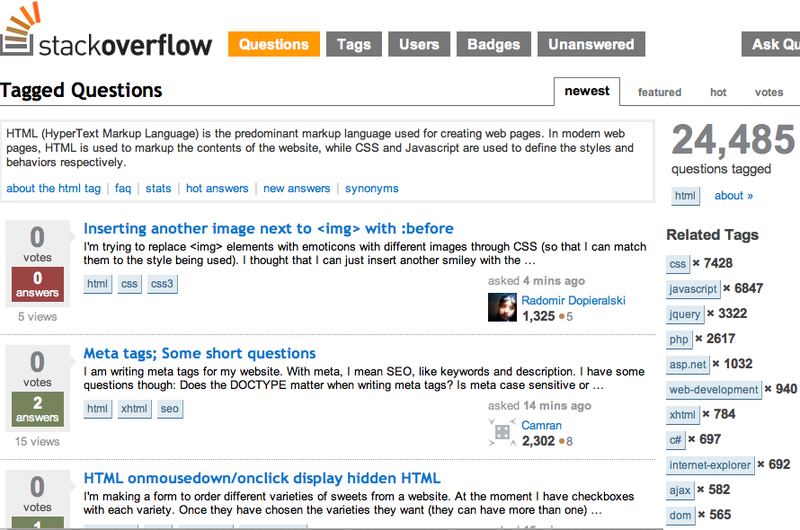 But in reality, apart from a few Firefox plugins such as Operator and Tails Export, there was little ongoing interest in microformats. This is a reasons why I find the schemas.org announcement particularly exciting – and the coordinated posts from Yahoo and Microsoft in addition to Google will help to address concerns that this is an attempt by Google to enforce a company-specific solution on the Web. But where does this leave RDFa? As explained in a page about the schemas.org data model: “Our use of Microdata maps easily into RDFa 1.1. In fact, all of Schema.org can be used with the RDFa 1.1 syntax as is” although the page concludes with the warning that “Microdata does not have analogs for RDFa features such as CURIES, Turtles, Chaining, Typed vs Plain literals, etc.“. The discussions and arguments about the underlying structure of semantic markup on HTML resources will focus on the different approaches (microformats, RDFa and the schemas.org support for the microdata approach) and, as we have seen, the issues about ownership of the approaches. 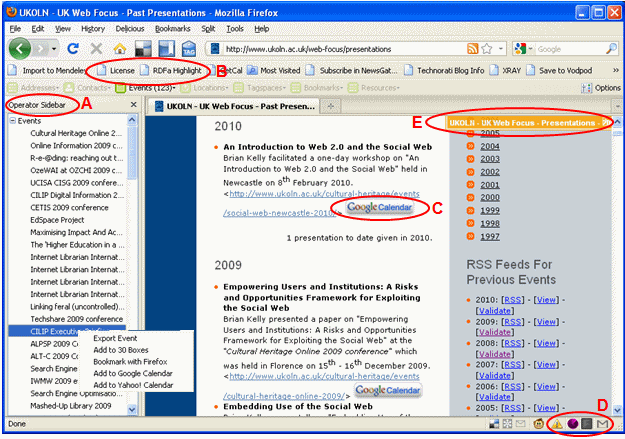 It should be pointed out, however, that microdata is part of HTML5 and the HTML5 Microdata draft was published on the W3C Web site on Wednesday 1 June 2011. So whilst the editor of the draft is based at Google it should be acknowedged that many W3C standards have been developed by those working in commercial companies and that this can help to ensure that standards are deployed and gain acceptance in the marketplace. But in addition to the discussions about approaches to exploiting microdata consideration will also have to be given to ways in which content can be exposed to the social web in order for individuals to share their recommendations across theirs networks. We have already seen the how the popularity of the ‘Like’ button has led to the release of the ‘Send’ button, which is based on Facebook’s Open Graph Protocol, which has been described as “A Meaningful First Step to a True Semantic Web”. But what of Google +1? And what of the user experience with a seemingly ever-growing array of buttons which can be used to promote Web resources across social web environments including not only Facebook and Google but also microblogging environments such as Twitter? In a post entitled “Why the Button War? Because Content is Social Currency [10 Links]” Tac Anderson describes how buttons (whether a Facebook ‘Like’, a Twitter Retweet, the rating button at the bottom of this post or whatever) provide a ‘point of transaction’ where one says “Yes I associate myself with this piece of content” . Tac argues that “As a publisher buttons are invaluable as a way to make you content shareable, raise awareness, drive engagement and ultimately increase visits and regular readers“. Whilst the focus of the post seems to be the more general commercial and social uses of the Web, the need to make “content shareable, raise awareness, drive engagement and ultimately increase visits and regular readers” is also true for those of us working across the higher education sector, whether in teaching and learning, research or marketing areas. I can’t help that feel that resource discovery is getting very interesting – and I’d welcome comments on how we feel that our sector should respond. The significance of the development work to HTML5 specifications and the importance which W3C is giving to HTML5 can be seen from the announcement that “W3C Introduces an HTML5 Logo” which describes this “striking visual identity for the open web platform“. In addition to Web sites owners being able to use this logo on their Web sites and fans of HTML5 being able to wear a T-shirt (“wearware”?) as I learnt from Bruce Lawson’s post on “On The HTML5 Logo” users of FireFox and Opera browsers can install a Greasemonkey Script or Opera extension which will display a small HTML5 logo in the top right hand corner of the window of HTML5 pages. I’ve tried this and it works. Such marketing activities are unpopular in some circles with much of the criticism “centered around the FAQ’s original statement that the logo means “a broad set of open web technologies”, which some believe “muddies the waters” of the open web platform“. 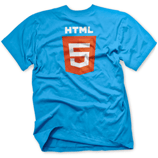 In light of such concerns the W3C have updated the HTML5 Logo FAQ. I have to say that personally I applaud this initiative. In the past the commercial sector has taken a lead in popularising Web developments as we saw in the success of the Web 2.0 meme – it’s good, I feel, that the W3C are taking a high profile in the marketing of HTML5 developments. I also feel that this is indicative of the importance of HTML5, which, judging from examples of HTML5’s potential which I have described in a number of recent posts, will be of more significance than the moves from HTML 3.2 to HTML 4 and HTML 4 to XHTML 1. Use of the Opera extension which embeds a small version of the HTML5 icon in the top right hand corner of the browser display is shown (click to see full-size version). I had previously thought that Google was very conservative in its use of HTML as, in light of its popularity, the page had to work of a huge range of browsers. Note, though, that on using W3C’s HTML validator, which includes experimental support for HTML5, I found that there were still HTML errors, many of which were due to unescaped ‘&’ characters. Some time ago it was suggested that the reason Google wasn’t implementing the simple changes in order to ensure that their home page validated was in order to minimise the bandwidth usage – which will be very important for globally popular site such as Google’s which, despite losing the top slot to Facebook in the US last year, is still pretty popular :-). Hmm, if there are around 90 million Google users per day I wonder how much bandwidth is saved by using & rather than & in its home page and search results? HTML5: Are Museum Web Sites Ahead of HE? Martin Hawksey, a prolific blogger on the RSC Scotland North and East blog, recently alerted me to an article published in the ReadWriteWeb blog which describes how Scotland Trailblazes the Use of HTML5 in Museums. The trailblazing Scottish institution wasn’t a University or a Web development or Web design company – rather it was the National Museums Scotland Web site. The National Museums of Scotland have become the first major museum organization in the world to fully implement HTML5. Museum digital media tech manager Simon Madine explained in a blog post that the implementation across the five allied sites was married to an overall redesign. That redesign saw the site gain color and shoulder-room and emphasize more visuals. But the implementation of HTML5 is more revolutionary. It allows a greater level of search engine accessibility, easier rendering across browsers and overall makes it easier to elegantly add and change site content. According to Hugh Wallace, NMS head of digital media “The site should be eminently more findable too as it’s structured for the way Google reads pages“. In fact, the only other museum that Wallace’s crew could find that has fully implemented the language is The American Sport Art Museum and Archives. I recently attended the 18th Bathcamp event entitled “Faster, cheaper, better!“. For me the highlight of the evening was a talk by Elliott Kember (@elliottkember) on “HTML5 / CSS3 / JS – a world of new possibilities“. and wants to develop your idea into an application. Elliott gave a fascinating run through some of the new presentational aspects of HTML5 and CSSS, appropriately using a HTML5 document to give the presentation. His slides are available at http://riothtml5slides.heroku.com/ and are well worth viewing. Note that to progress through the slides you should use the forward and back arrows – and not that Elliott was experimenting with some of the innovative aspects of HTML5 and CSS3 so the presentation might not work on all browsers. In this post I’ll not comment on the HTML5 features which Elliott described. Rather than looking at the additional features I’ll consider the implications of the ways in which the HTML5 specification is being simplified. <!--DOCTYPE HTML PUBLIC "-//W3C//DTD HTML 4.01//EN"
As can be seen there is no requirement to include the <head> and <body> elements which are needed in order for a HTML 4 document to be valid (although HTML 4 documents which do not include these mandatory elements will be rendered correctly by Web browsers. Over the years developments to HTML standards have always given rise to the question “What about legacy browsers?“. Often the answer has been “The benefits of the new standard will be self-evident and provide sufficient motivation for organisations to deploy more modern browsers“. Whether the benefits of the developments from, say, HTML 3.2 to HTML 4 and HTML 4 to XHTML 1 have provided sufficient motivation for organisations to invest time and effort in upgrading their browers is, however, questionable – I know I have been to institutions which are still providing very dated versions of browsers on their public PCs. And whether the HTML technology previews which tend to be demonstrated when a new version of HTML is released will be typical of the mainstream uses may also be questioned. So there is still a question about the deployment of services based on HTML5 in an environment of flawed browsers, which includes Internet Explorer; it should also be noted that other browsers may also have limited support for new HTML5 (and CSS 3) features. Elliott suggests that a solution to the “What about IE?” question may be provided by a HTML5 ‘shim’. A shim (which is also sometimes referred to as a ‘shiv’) is described in Wikipedia as “a small library which transparently intercepts an API, changes the parameters passed, handles the operation itself, or redirects the operation elsewhere“. Should you start using HTML5 now? Back in July in his plenary talk on “HTML5 (and friends): The future of web technologies – today” given at the IWMW 2010 event Patrick Lauke suggested that for new Web development work it would be appropriate to consider using HTML5. All decent browsers support enough of this stuff to make it worth using. What this means is that you can start to make use of the simple HTML5 declaration but rather than use every HTML5 feature that is documented in the specification you should check the level of support for various features using, for example the Periodic Table of HTML5 Elements and the HTML5 Test web site and Wikipedia’s Comparison of layout engines (HTML5) as well as running standard usability checks on an appropriate range of browsers and platforms. What About Validity of HTML5? Following Elliott’s talk there was a question about the validity of HTML5 documents. Elliott responding with a very graphic depiction of the much more liberal (if one dare uses that word!) approach to validity: “If you bang your head against the keyboard you’ll probably create a valid HTML5 document!“. Such an approach is based on observing how few Web resources actually conform with existing HTML specifications. In many cases browser rendering is being used as an acceptable test for conformity – if a Web page is displayed and is usable in popular Web browsers then it is good enough seems to be the situation today. “After all” asked Elliott “how many people validate their Web pages today?” The small numbers of hands which were raised (including myself and Cameron Neylon) perhaps supported this view and when the follow-up question “Who bothers about using closing tags on <br> elements in XHTML documents these days?” was asked I think mine was the only hand which was raised. The evidence clearly demonstrates that strict HTML validity, which was formally required in XHTML, has been rejected in the Web environment. In future, it would seem, there won’t be a need to bother about escaping &s and closing empty tags, although if Web authors wish to continue with such practices they can do so. Such simplicity seemed to be welcomed by many who attended the Bathcamp meeting. But myself and Cameron Neylon, an open science researcher based at the Science and Technology Facilities Council, still had some concerns. What will the implications be if a HTML resource is being used not just for display and user interaction, but as a container for structured information? How will automated tools process embedded information provided as RDFa or microdata if the look-and-feel and usability of a resource is the main mechanism for validation of the internal consistency of a resource? And what if an HTML5 document is used as a container for other structured elements, such as mathematical formulae provided using MathML; chemcial formula provided using CML; etc.? There are dangers that endorsing current lax approaches to HTML validity can hinder the development of more sophisticated uses of HTML, especially in the research community. We are currently seeing researchers arguing that the main document format for use in scientific and research papers should move away from PDF to a more open and reusable format. HTML5 has been suggested as a possible solution? But will this require more rigourous use of the HTML5 specification? And if the market place chooses to deploy tools which fail to implement such approaches, will this act as a barrier to deployment of HTML5 as a rich and interoperable format for the community? In the past we have tried to make use of the IWMW Web site as a test bed for various emerging new HTML technologies. On the IWMW 2010 Web site this year we evaluated the OpenLike service which “provides a user interface to easily give your users a simple way to choose which services they provide their like/dislike data” as well as evaluating use of RDFa. We also have an interest in approaches to migration from use of one set of HTML technologies to another. The IWMW 2010 Web site has therefore provided an opportunity to evaluate deployment of HTML5 and to identify possible problem areas with backwards compatibility. We migrated top-level pages of the Web site from the XHTML1 Strict Doctype to HTML5 and validation of the home page, programme, list of speakers, plenary talks and workshop sessions shows that it was possible to maintain the HTML validity of these pages. A small number of changes had to be made to in order to ensure that pages which were valid using an XHTML Doctype were valid using HTML5. In particular we had to change the form> element for the site search and replace all occurrences of <acronym> to <abbr>. We also changed occurrences of <a name="foo"> to <a id="foo"> since the name attribute is now obsolete. Line 175, Column 51: Bad value http://www.foo.bar for attribute href on element a: DOUBLE_WHITESPACE in PATH. Any URL. For example: /hello, #canvas, or http://example.org/. Characters should be represented in NFC and spaces should be escaped as %20. This seems to be an example of an instance in which HTML5 is more restrictive than XHTML 1 or HTML 4. An object element must have a data attribute or a type attribute. related to the embedding of a Slideshare widget. 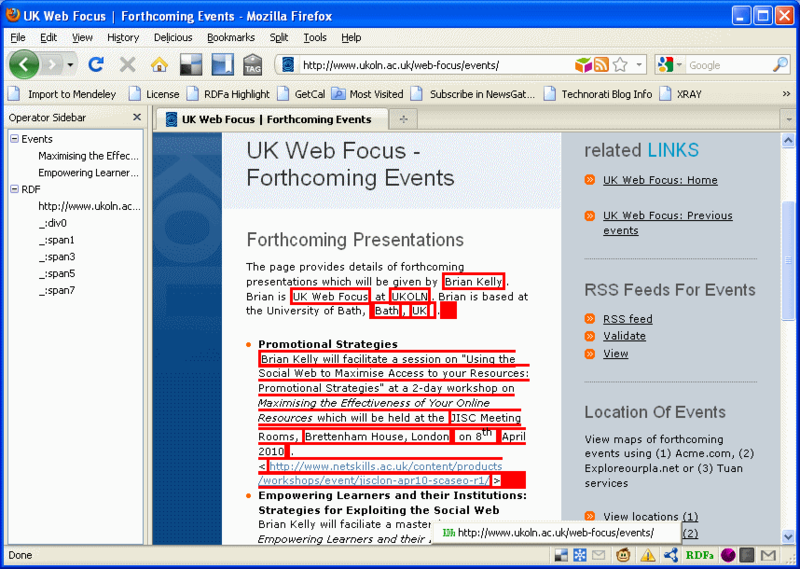 The Web pages for each of the individual plenary talks and workshop sessions contained embedded RDFa metadata about the speakers/workshop facilitators and abstracts of the sessions themselves. 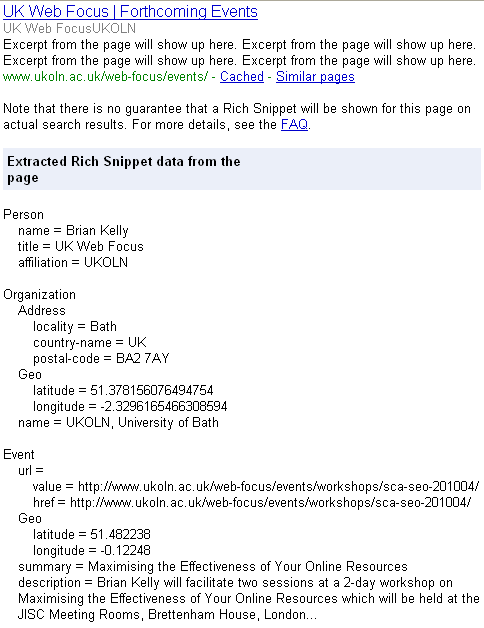 As described in a post on Experiments With RDFa and shown in output from Google’s Rich Snippets Testing tool RDFa can be used to provide structured information such as, in this case, people, organisational and event information for an IWMW 2010 plenary talk. However since many of the pages about plenary talks and workshop sessions contain embedded third party widgets including, for the plenary talks, widgets for videos of the talks and for the accompanying slides, these pages mostly fail to validate since the widget code provided by the services often fails to validate. A page on “Parallel Session A5: Usability and User Experience on a Shoestring” does, however validate using the XHTML1+RDFa Doctype, since this page does not include any embedded objects from such third party services. However attempting to validate this page using the HTML5 Doctype produces 38 error messages. The experiences in looking to migrate a Web site from use of XHTML 1 to HTML5 shows that in many cases such a move can be achieved relatively easily. However pages which contain RDFa metadata may cause validation problems which might require changes in the underlying data storage. 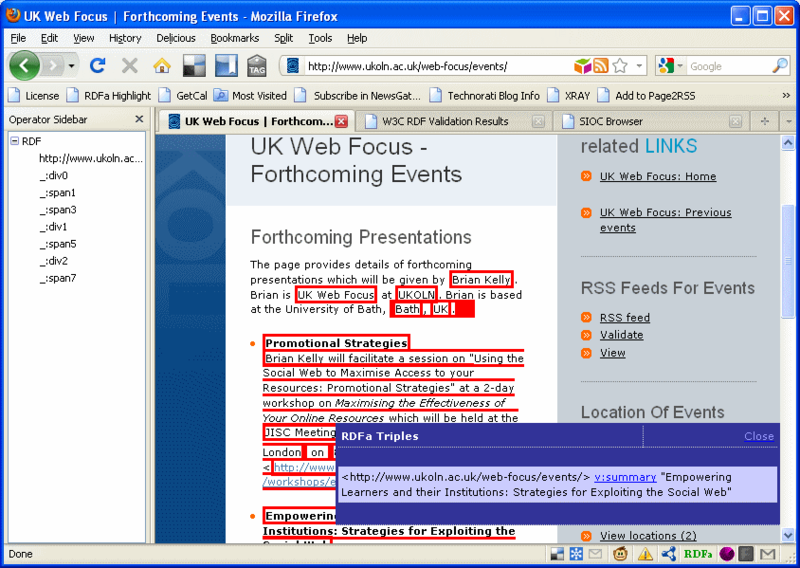 The W3C released a working draft of a document on “HTML+RDFa 1.1: Support for RDFa in HTML4 and HTML5” in June 2010. 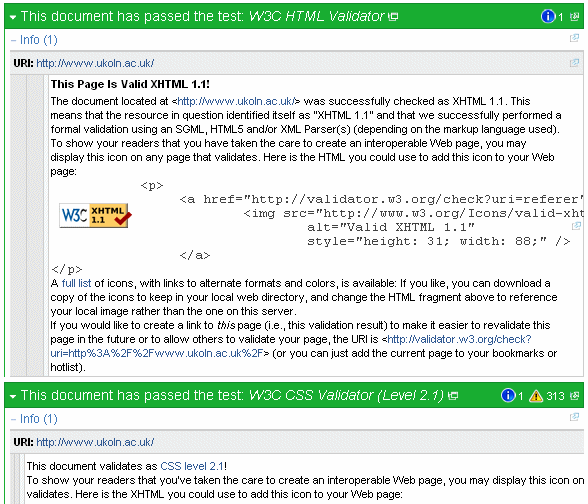 However it is not yet clear if the W3C’s HTML validator has been updated to support the proposals containing in the draft document. 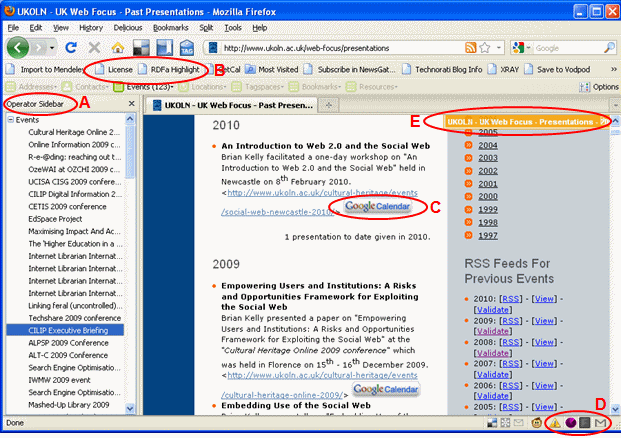 It is also unclear how embedding RDFA in HTML5 resources relates to the “HTML Microdata” working draft proposal which was also released in June 2010 (with an editor’s draft version dated 20 October 2010 also available on the W3C Web site). I’d welcome comments from those who are working in this area. In particular, will the user interface benefits provided by HTML5 mean that HTML5 should be regarded as a key deployment environment for new services, or is there a need to wait for consensus to emerge on ways in which metadata can be best embedded in such resources in order to avoid maintenance problems downstream? A couple of days ago there was an announcement that “Apple [is] Ditching Preinstalled Flash On Future Macs“. On the surface this decision has been taken to minimise security problems associated with Flash software – as described on the CultOfMac blog “By making users download Flash themselves, Apple is disavowing the responsibility of keeping OS X’s most infamously buggy and resource heavy third-party plugin up to date on users’ machines“. The Guardian reported the news in rather more aggressive terms: “Apple has escalated its war with Adobe’s Flash Player by stopping including the browser plugin on the Macintosh computers that it sells” and points out how this will inconvenience many users as “The surprising and unannounced move means that buyers will have to figure out how to download the player and plugin on any of the computers that they buy – a process which Apple has not simplified by including any “click to install” links“. Since the Guardian article pointed out that “Jobs has criticised [Flash] as ‘proprietary’” and “praised HTML5 and the video codecs available on it” this story might be regarded as a success story for open standards. But there is a need to be aware that Flash’s proprietary nature has been recognised as a concern to those seeking to make use of open standards in development work for some time. The NOF-Digitise Technical Advisory Service provided an FAQ which pointed out in about 2002 that “Flash is a proprietary solution, which is owned by Macromedia. As with any proprietary solutions there are dangers in adopting it as a solution: there is no guarantee that readers will remain free in the long term, readers (and authoring tools) may only be available on popular platforms, the future of the format would be uncertain if the company went out of business, was taken over, etc.“. It is only now, about eight years after that advice was provided, that we are seeing Flash started to be deprecated by major players and open standards alternatives being provided by such vendors. And although the vendors will inevitably cite the benefits of open standards in their press releases, since such benefits have always been apparent, in reality decisions to support open standards are likely to have been made by vendors for commercial reasons – in this case competition between Apple and Adobe. But what can be learnt from such history lesson? Perhaps that the availability of an open standard is no guarantee that it will supersede proprietary alternatives and that commercial vendors can have a significant role to play in ensuring the take-up of open standards. In which case it does seem that HTML5 will be an important standard and Flash is under threat. But whilst that view seems to be increasingly being accepted it is worth noting concerns that have been raised within W3C, the World Wide Web Consortium, with Philippe Le Hegaret pointing out that “The problem we’re facing right now is there is already a lot of excitement for HTML5, but it’s a little too early to deploy it because we’re running into interoperability issues”. Hmm, it seems as if the HTML5 maturity debate will continue to run. We are “Scrapping Flash and betting the company of HTML5” says the CTO of Scribd (the document sharing service) according to an article published recently in TechCrunch. But this doesn’t seem to be as much of a risk as the headline implies as, according to the article “Adobe’s much-beleaguered Flash is about to take another hit and online documents are finally going to join the Web on a more equal footing“. As the article goes on to say “Scribd is joining a chorus of companies from Apple to Microsoft in siding with HTML5 over Flash. Tomorrow only 200,000 of the most popular documents will be available in HTML5, but eventually all of them will be switched over“. The article goes on to point out that “When it’s done, Scribd alone will convert billions of document pages into Web pages“. Good, you may think, it’s about time we made greater use of open standards. And this sentiment underpinned various standards documents I have contributed to since about 1996 for the JISC and the cultural heritage sector. As an example consider the NOF-digitise Technical Advisory Service which was provided by UKOLN and the AHDS from 2001-2004. These two service were commissioned to document the open standards to be used by this national digitisation programme. So we described open standards, such as SMIL and SVG, and, despite warning of the dangers in mandating premature adoption of open standards, the first version of the standards document did not address the potential difficulties in developing services based on these immature W3C standards. Unsurprisingly, once the project had received their funding and began to commission development work we received questions such as “Does anyone have any thoughts on the use of file formats such as Flash or SVG in projects? There is no mention of their use in the technical specifications so I wondered whether their suitability or otherwise had been considered“. I can remember the meeting we had with the NOF-digitise progamme managers after receiving such queries and the difficulty policy makers had in appreciating that simply mandating use of open standards might be inappropriate. The general advice is that where the job can be done effectively using non-proprietary solutions, and avoiding plug-ins, this should be done. If there is a compelling case for making use of proprietary formats or formats that require the user to have a plug-in then that case can be made in the business plan, provided this case does not contradict any of the MUST requirements of the nof technical guidelines document. Flash is a proprietary solution, which is owned by Macromedia. As with any proprietary solutions there are dangers in adopting it as a solution: there is no guarantee that readers will remain free in the long term, readers (and authoring tools) may only be available on popular platforms, the future of the format would be uncertain if the company went out of business, was taken over, etc. To, to summarise, if you *require* the functionality provided by Flash, you will need to be aware of the longer term dangers of adopting it. You should ensure that you have a migration strategy so that you can move to more open standards, once they become more widely deployed. It seems, according to Jobs, that it is the requirements of the mobile platform which is leading to the move towards open standards on both mobile and PC platforms. About eight years later it now seems appropriate to move away from Flash and, instead, use HTML5. This long period between initial announcements of new open standards and their appropriateness for mainstream use will differ for different standards – in the case of RDF, for example, the initial family of standards were published in 2004 but it has only been in the past year or so that interest in the deployment of Linked Data services has gained wider popularity. But the dangers of forcing use of open standards is, I hope, becoming better understood. And this is where I disagree with a recent article by Glyn Moody who, in a recent tweet, suggested that “European Commission Betrays Open Standards – http://bit.ly/bl6HJt pusillanimity“. In an article published in ComputerWorld UK Glyn argued that the “European Commission Betrays Open Standards“. I have skimmed through the latest leak [PDF format] of an imminent Digital Agenda for Europe. What I noticed is that the document calls for “Promoting better use of standards” which argues that “Public authorities should make better use of the full range of relevant standards when procuring hardware, software and iT systems”. It is the failure of the document in “promoting open standards and all the benefits that these bring” which upsets Glyn, who adds that “accept[ing] ‘pervasive technologies’ that *aren’t* based on standards” is “a clear reference to Microsoft“. But maybe the European Commission have understood the complexities of the deployment of open standards and the risks that mandating their use across public sector organisations might entail. And let’s not forget that,in the UK, we have a history of mandating open standards which have failed to take off – remember OSI networking protocols? Pointing out that open standards don’t always live up to their promise and it make take several years before they are ready for mainstream use is applying an evidence-based approach to policy. Surely something we need more of, n’est-ce pas? Will The UK Government Shut Down The Queen’s Web Site? In a post on All UK Government Web Sites Must Be WCAG AA Compliant I recently warned of the dangers that the UK Government’s blunt instrument of mandating that all UK government Web sites must comply with WCAG AA accessibility guidelines could be counter-productive as the current WCAG 1.0 guidelines are widely felt to be out-of-date and government departments which seek to comply with the guidelines may well result in Web design patterns which are now widely felt to enhance the effectiveness of Web sites but which infringe guidelines released back in 1998 being discarded. I recently viewed the Official Web Site of the British Monarchy (don’t ask) and spotted a visible <FONT> tag preceding a news item about the Queen’s speeches in Uganda. Now this page clearly fails to comply with the UK Government proposed accessibility requirements. What, then, will happen if these proposals are accepted and the Queen fails to correct the errors by next year’s deadline? Will the Government attempt to shut down Her Majesty’s Web site? Will the Government take the Queen to court? But won’t “Regina vs Regina ” lead to a constitutional crisis? Will this lead to the demise of the monarchy and the establishment of a republic? Or will such a vindictive move by pedantic civil servants lead to a backlash, with the possibility of the Tower for the more extreme of the ‘accessibility standardistas‘? More seriously the British Monarchy Web site probably does provide a good example of a service (perhaps not quite a public-sector service, though) which would be improved by simply following the WCAG guidelines. So maybe my concerns would only apply to those Web sites which are seeking to be more interactive and user-focussed than the brochureware approach which the British Monarchy site provides. Well, there are some unequivocal positions! And look at that last comments: “the people that want it are the very last people that should be allowed to have it.” What happened to having a user-focussed approach to Web development? We always use HTML based e-mail for our marketing (we send multipart e-mails with a text version so that most users should see something on their screen). All our e-mail marketing is opt-in and we give an unsubscribe link on every message sent, partly because that’s the law, but mainly because it’s polite – we’re happy that our unsubscribe rate is reasonably low. We developed a set of corporate templates which were thoroughly tested with Outlook, Outlook express, Hotmail, Gmail, Mac mail, et al (if you think getting HTML to render in a variety of browsers is fun wait until you start developing HTML e-mail!). Every message we send is sent to test accounts using a variety of e-mail services before we send in bulk. It does strike me that there are two polarised communities. Coincidentally around the time this discussion was taking place I attended the Aoc Nilta conference [note Web site no longer available – 12 Jan 2009], at which, as described in a posting by Scott Wilson, personalisation was one of the key themes of the conference (and, as described recently by the BBC, is also on the Government’s agenda). My view? I’m on the side of providing flexibility for the user community – and if the marketing community are the ones who try to respond to the users’ needs, then we should be working more closely with that group, rather than the dated technical views of the grizzled techies!